Well some people are there, even among the celebrities who loved to be in the middle of gossip, whether it is Paris Hilton, Lady Gaga or the Jay Leno. This fellow was recently spotted on a road trip on a 150 years old car. Yea, you usually do not see them on the street but they rest more in the museums and Jay Leno got his legs to stretch on the Stanley Steamer. The vehicle was originally dating back to 1906; probably you or your father did not born at that time. 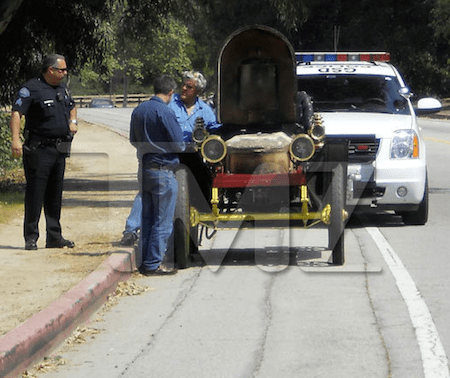 The report from TMZ says the steam powered car on Burbank got out of running and this led to much trouble as cops came in. But they did to aid him; Jay Leno is reported to have his ancient cart re-ignited for the go.